Born at Manchester, England on 2 April 1859, son of Samuel Berry and Elizabeth Ann Bentley, he attended Stretford public schools then served with the Third Cheshire Rifles. In 1878 he established himself as a general merchant in his home city. During this time he also served as a member of the First Manchester Volunteer Rifles. From 1880 to 1884 he was with the Royal Marine Artillery but in the latter year resigned in order to become a member of the Salford police force. 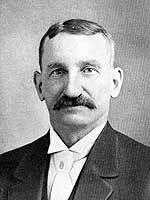 In 1890 he emigrated to Canada and homesteaded in Saskatchewan. At the same time he worked for the Canadian Pacific Railway in the locomotive department, serving as fireman until 1892, in which year he came to Winnipeg and engaged in the real-estate business. He operated independently until 1900 and then formed the firm of Berry & Bond, with offices at 325 Main Street. In 1910 he organized the real-estate firm of Berry & Carson and opened his place of business at 248 Tache Avenue, Norwood. He became involved in the municipal politics of St. Boniface, first being elected alderman in 1907 and serving until 1911. In the following year he was elected the first Anglophone mayor of St. Boniface. In July 1881, he married Elizabeth Ann Hindley (?-1933), daughter of George Hindley, of Manchester. He and his wife were enthusiastic motorists and Berry was also interested in hunting during the season. The family lived at 112 Eugenie Street, Norwood. He was a life member of the AF & AM (St. John’s Lodge, No. 4), a member of Prince Rupert’s Chapter, No. 52, R. A. M.; of King Edward Preceptory, No. 24; and Khartoum Temple, A. A. O. N. M. S. He was worshipful past master of Norwood Lodge, AF & AM. He was also chief ranger of Court Excelsior, No. 6898, A.O.F. ; chief ranger of Court Norwood, No. 1006, COF; past chancellor of Norwood Grove Lodge, No. 33, K. P. and the Uniformed Rank ; and noble grand of Ridgeley Lodge, No. 35, IOOF. He retired to Alhambra, California where he died on 13 January 1933 and was buried. He is commemorated by Berry Street in Winnipeg. “Tom Berry, mayor of St. Boniface in 1912-13, dies” Winnipeg Free Press, 14 January 1933.